Friday night the sky was overcast, so no moonlight relieved the darkness. Lynnie and I went into the backyard where no artificial lights shown. And there we lived the magic of the lightning bugs--the sky was full of the little flashing lights. 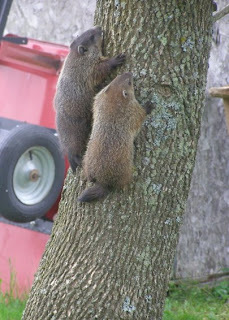 Some were so close you could catch them (I leave them alone) and some darted here and there. It was like a personal light show--mini fireworks. It's just so incredible to stand in the dark and be surrounded by tiny flashing lights that extend as far as the eye can see in any direction. I remember reading that lightning bugs are only in certain parts of the country--what a shame that so many will never experience them. I thought you might enjoy seeing some of my treasures. Below is my roll top desk topped with crystal candle holders, candles, a pink Santa, and various other pretties. 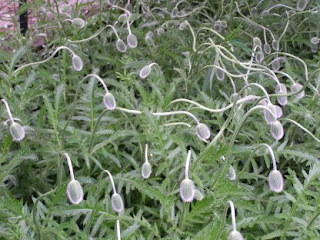 There is a string of white lights intertwined through the items and it is an especially impressive show at night. 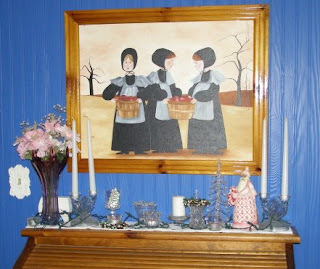 The painting is an original by Kay Stash. I leave up the things I like year-round. Why hide them and enjoy them only at certain times of the year? Here is the display on the top of my refrigerator. The church was made by Kay's late husband, Andy, and is surrounded by pieces of white china and two handmade candlesticks. The swan sitting in the dish had originally been a swan planter. Unfortunately, it got dropped right after I bought it, but I couldn't bear to just throw the head/neck/front part away. The dish was a perfect was to display what was left, and it adds a bit of uniqueness to the display. For the record, my refrigerator is covered with family pictures and interesting bits and pieces. Most would think it a bit messy-looking, but I like having my favorite things in plain site. Yesterday I taught 10 ladies how to hand piece little Thimble quilts. They are so cute and easy to make. For one of the ladies, it was her very first quilting class ever--she did so well that you would think she'd been quilting forever! A wide range of fabrics were used; some concentrating on themes (Christmas, florals, etc.) and some taking a more random approach. It was a great time and a wonderful way to spend a Sunday afternoon. 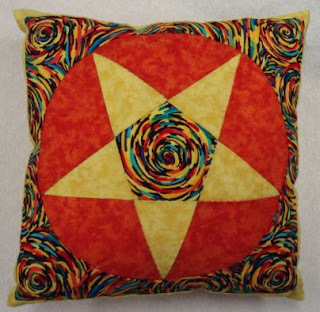 I have bound another 5-pointed star quilt, have the binding almost hand sewn down on another Dresden Plate. At the moment I am hard at work getting ready for my teaching trip to Florida next week. New handouts, samples, stuff for the trunk show--trying to figure out what I can fit into my carry on in case my check through bag doesn't get there--ah, the joys of being a traveling quilt teacher. And you thought it was all glamour! 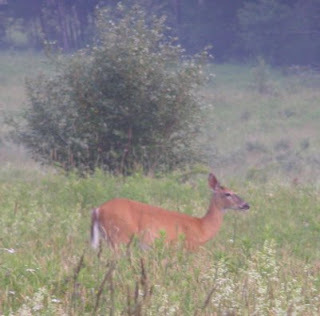 A beautiful doe not far from my window--do you ever wonder if the animals/birds are as interested in watching us as we are in them? Did the turtle from a few posts ago go home and say "Some crazy lady with a black thing in her hand kept talking to me and clicking the black thing--what a weirdo-I was lucky to escape unscathed!" Remember to practice safe rotary cutting--always cut away from yourself and to keep the guard on when you are not actually cutting. You offenders already know who you are--but, I will be the first to say "I told you so!" when you cut yourself! Don't make me go there. Happy Monday--and sew something, already! It'll make you feel better! 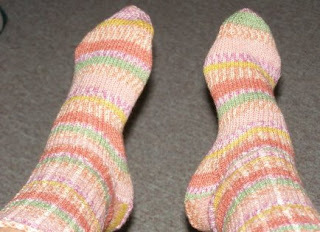 For your viewing pleasure--here are two pictures of my first pair of socks! Yes, I know each sock starts at a different place in the yarn. But, being a newbie to sock knitting, I wasn't sure if I'd have enough yarn to finish the second sock if I started them the same. I would have lost quite a large repeat and figured it wasn't worth taking a chance. 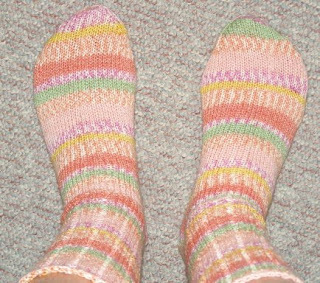 The yarn is Plymouth Sockotta (knit on size 1 needles) and makes the patterns itself--see, I could have taken credit for all those fabulous stripes, but I didn't! I have the first sock done in a pair for my mom and the second one cast on and a bit of ribbing done. These are in a superwash wool (worsted weight) on size 5 needles. Needless to say, the thicker yarn and bigger needles makes for much faster sock knitting! 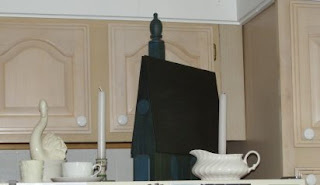 On the right side of the blog is a new box--this is an entry port to the Quilt Teacher Blog Ring, where you can read quilting blogs from the likes of the Piece O'Cake gals, John Flynn, Karen Combs, Mary Stori and more. Check it out--it's fun to get a different perspective on our most favorite of activities--yes, that would be quilting!!! Housework may never have killed anyone, but why take the chance? Quilting forever, housework.........only when you absolutely have to! Hasta la vista, fellow quilters! Well, we are almost back to Thump Day. Where do the weeks go? On Sunday, June 22, I will be at Calico Gals in Fayetteville, New York, from noon until 3 p.m. to promote the release of "Dresden Plates of Distinction" in CD format. The book has been out of print for over a year, so this is big news! No one will have to pay almost $300 on the internet to own a copy of the book! (That's how much the paper copies are selling for in one place; almost $80 on Amazon!) If you are in the area, stop in and say hey. On June 14, I did a short labeling lecture at the Consortium show in Cicero. 27 women, who all swore they could not draw, left with a small inked wreath that looked like a million bucks! After the lecture I went down to the vendor area, where some of the students were showing off their handiwork. Their "friends" said that they must have traced the design, or done something else--it could not possibly have been "drawn" by the students. Luckily, I was able to assure everyone that indeed each student had drawn their own wreath--and there were 27 samples to prove it! Empowerment at its finest! Each woman went home knowing that she could draw and with proof in hand! I'm always amazed at how quickly time passes. 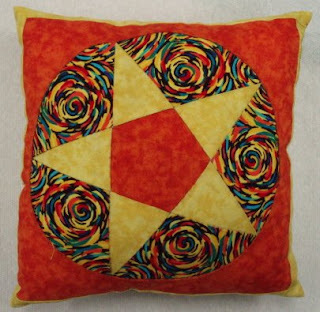 Each year in September I start a new hand pieced block of the month series. And each year, June seems like an eternity away. Yet, here it is June again and yesterday was the last class for this session. For any of you Bliss-ters reading this, thank you for a fabulous year! It is so rewarding to form friendships with so many wonderful women. The best part of a long-term class is that everyone has a chance to bond, to form a support group, to get to know each other. I remember about a year ago I was getting ready to go to lunch with four other ladies. And in an existential moment was wondering if I was really making a difference--I am after all teaching quilting--it's not like I'm a brain surgeon! It was then that I realized that the four women I was meeting for lunch did not know each other before taking classes with me--and WE are now all friends--through thick and thin, quilting or not quilting. So the answer to my question was Yes, I do make a difference. We ALL make a difference--for good or bad--we may just not see it. Let's use our power for good. "Be kinder than necessary, for everyone is fighting some kind of battle." I don't know who said it, but truer words were never spoken. Good night...or...good morning! 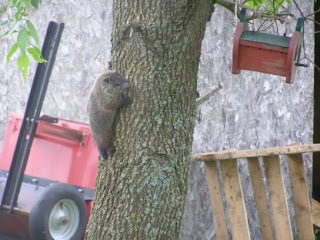 A couple days after I posted the picture of Mama Woodchuck and her baby, I looked out my sewing room window and saw this! 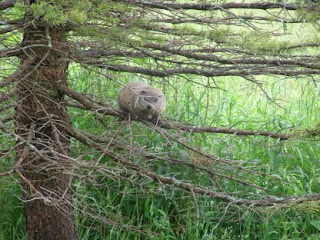 Yes,that is a small woodchuck up the tree! The birdhouse is over five feet from the ground (you cannot see the base of the tree in the picture), so you can judge how far up s/he is! Today we had a severe thunderstorm, with high winds, heavy rain, hail...the works. 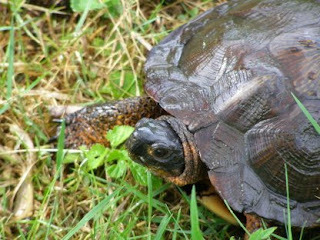 After the storm passed, I again looked out my sewing room window and saw a turtle hightailing it across the backyard. Off I go, camera in hand.... 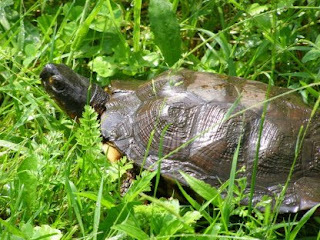 I think it's a box turtle (it's definitely not a snapping turtle). I managed to get a dozen good pics before s/he returned to the weeds. There is no standing water within hundreds of feet of my yard, so I'm not sure if it was a female laying her eggs and departing, or what the story was. Don't you wish they could talk? Yes, okay, I did ask--but got just the hairy eyeball stare in answer. In answer to one of the comments: Yes, I will announce my new batting choice--when I make one. I'm still testing! I finished my first pair of socks! I'll post a picture another day, since this really is the Z00 day! I am quite taken with them. I have not cast on a new pair--trying to finish the two things I still have on needles. My phone line (and only my phone line) was hit by lightning on Sunday afternoon and it was not fixed until this morning. I put the time to good use by adding borders, marking for quilting and quilting (hand) a new Thimbles sample. It's ready for binding. I also started hand quilting my next 5-pointed Star Hand Piecing sample--it's done in fabrics I don't care for and had almost decided to (gasp!) machine quilt it. It's about 1/3 done and looks good. The quilting is making a big difference. Then, with the push to be "green", I tried the cotton/PLA blend and the 100 percent PLA. Unfortunately, the washing instructions were rolled up in the batting, so I didn't see them until I had purchased and opened the packaging. Here are the instructions: "Machine wash cold, gentle cycle. Lay flat to dry. Do not dry clean. Do not iron." Because inquiring minds want to know--they really do mean DO NOT IRON. I put a sample of each between fabric squares and pressed them on cotton--one melted into a dense mass and the other became rather brittle. Yes, I know the packaging said DO NOT IRON. But I wanted to know what would happen--worst case scenario--and now I do. The search is not over yet--I'll keep you posted on my progress. Any suggestions? Remember it's for hand quilting and I use it for classes in fine hand quilting as well as for my personal pieces. Good news: I heard today from AQS that my book will be out on CD in about three weeks! I googled the book (which has been out of print for almost a year) and one site had two copies--one for $277 and one for $287! Yikes! The heel is turned on my second sock--pics when the PAIR is finished. 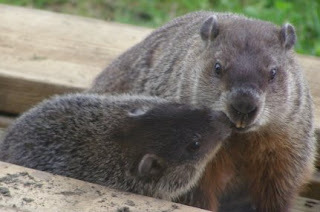 I'll leave you tonight with what I think is a delightful picture--my backporch woodchucks--mother and baby. Check out those teeth! Did you remember to do something nice for yourself today?